, and formulated this recipe from that. As I gather, a Thessaly sausage (Thessaly is in north-central Greece) gets its character from allspice, cumin and paprika. I happened to be short of paprika when I made these, and substituted Ethiopian berbere powder, which has chiles, cardamom, paprika and a host of other elements. It turned out to be a happy accident, and I highly recommend using berbere — although paprika is more traditional. 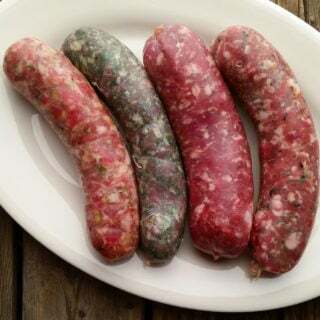 Be sure to remove as much silverskin and sinew as you can, because these are coarse, country-style sausages and you want to avoid gristly bits. 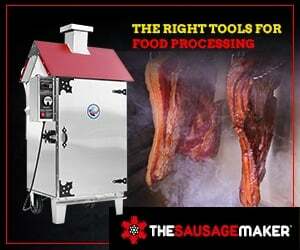 Start by reading my basic sausage-making instructions, which are hosted on my friend Elise’s site Simply Recipes. Chill the meat until it is almost frozen by putting it in the freezer for an hour or so. Chop meat and fat into 1 inch chunks. Take out half the black pepper. Why? You’ll want to add it right before you do that final mix. This keeps the spices whole, altering the sausage’s texture, making eating it more interesting. Combine the salt, half the pepper, and the herbs and spices with the meat, mix well with your hands and let it rest in the fridge for about an hour. Grind through your meat grinder (you can use a food processor in a pinch, but you will not get a fine texture) using the coarse die. If your room is warmer than 69 degrees, set the bowl for the ground meat into another bowl of ice to keep it cold. Add the rest of the black pepper, the vinegar and wine, then mix thoroughly either using a Kitchenaid on low for 60-90 seconds or with your (very clean) hands. This is important to get the sausage to bind properly. Once it is mixed well, put it back in the fridge. Stuff the sausage into the casings. Twist off links by pinching the sausage down and twisting it, first in one direction, and then with the next link, the other direction. Or you could tie them off with butcher’s string. Hang the sausages in a cool place for up to 4 hours (the colder it is, the longer you can hang them). If it is warm out, hang for one hour. Once they have dried a bit, put in the fridge until needed. They will keep for at least a week in the fridge. If you are freezing the sausages, wait a day before doing so. This will tighten up the sausages and help them keep their shape in the deep-freeze.